1977 marked not only their first ever visit to the movies but also a deeply memorable year of cinematography for Justin Thornton and Thea Bregazzi of Preen. Their Autumn/ Winter 2014 collection draws on two seminal, but aesthetically disparate films of that year; the androgynous whimsy of Annie Hall and the bold graphicness of Star Wars™. The languid silhouette of the seventies prevails throughout; drop-waist print dresses resemble Moorish tiles on silk, silk velvet devore and georgette. Hordes of fans queued for days buttoned up in their snorkel parkas before Star Wars’ release and it is a rather luxurious interpretation that Thornton and Bregazzi team with soft silk and thigh high boots. A deft touch of eccentricity fuses this collection, from the opulent deerstalker of exaggerated proportion to the closing green metallic lame parka; its unexpected shimmer offset by the gargantuan fox fur trim framing the face. A blood orange wool swing coat is oversized, fabric voluminous from behind. Thornton, himself a Star Wars aficionado, was delighted to be asked to collaborate with Disney and Lucasfilm, in incorporating the iconic imagery from the Star Wars series, into the collection; he and Bregazzi yielding to the villainous Darth Vader, who is emblazoned in an abstract way into their ethnic prints. The duo have most recently been delving into their archive for a project entitled ‘The Archivists’, and confess inspiration was drawn as much from their artistic origins in the early 90’s, as the arresting visual imagery from the contrasting films. 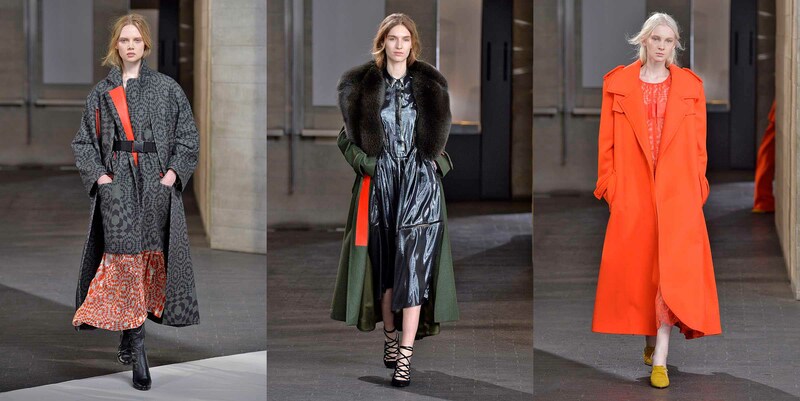 Preen have recruited their own army for Fall, a cavalcade of women clad in shades of reds and greens, their ammunition their effortless, eccentric blend of luxury. Lucasfilm, STAR WARS and related properties are trademarks in the United States and/or in other countries of Lucasfilm Ltd. and/or its affiliates. © 2014 & TM Lucasfilm Ltd.